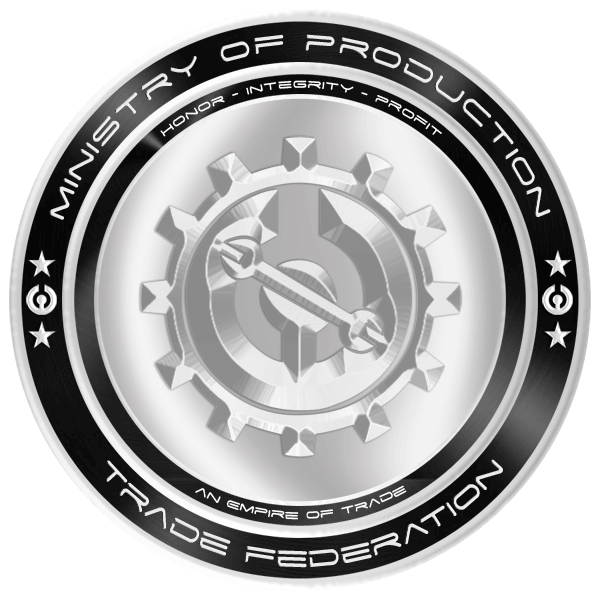 The Ministry of Production is responsible for the management and operation of all production and trading related activities conducted by the Trade Federation. Directed by the Cabinet, it is governed by the Minister of Production, and the Deputy Minister. The Ministry has undergone many revisions since its initial founding in year 9 by the Cabinet, with its inaugural Minister Olwin Froon at the helm watching over the Departments of Manufacturing, Naval Production, and Robotics. Currently it oversees the Department of Manufacturing, Department of Pharmaceuticals, and the Department of Trade. These departments provide the overarching structure for the manifold nationalised companies of the Trade Federation; Alpha Medical Corps, Baktoid Armour Workshop, Centurion Arms, Dorinian Military Corps, Kuat Drive Yards, Techno Union, and Rendili Stardrive. The Minister of Production is responsible for all ships, vehicles, droids, items and weapons produced by the Trade Federation and its subsidiaries. This includes Trade Federation owned companies Kuat Drive Yards, Techno Union, Dorinian Military Corps and Baktoid Armour Workshop. The position requires extensive experience in the field and to this day has always been filled by shipwrights form Kuat Drive Yards. 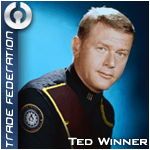 Ted Winner is the 4th Minister of Production of the Trade Federation. Appointed on 17 Day 287 by Viceroy Jacob Jansen and the Trade Federation Cabinet. The Department of Manufacturing represents the lion's share of the Trade Federation's productive capacity. Consisting of Centurion Arms, Dorinian Military Corps, Kuat Drive Yards, Techno Union, and Rendili Stardrive; the Department of Manufacturing is the successor to the Ministry's manifold production departments which existed until year 16. It is responsible for producing the widest possible range of equipment for the Federation's needs, from the least complicated of E-5 Blasters for our droid armies, to the near-indestructible Lucrehulk battleships which provide versatile support for the Federation's industrial and military infrastructure. The Trade Federation Department of Trade is the trade arm of the Federation. The department had its modest beginnings within the Trade Federation family and members. But from modest beginnings DoT grew into a full fledged department in the Trade Federation. From its first form as Federation Holdings Group to its current incarnation as the TFMN, the Department of Trade supplies items, weapons, ships, and RMs to both the TF and the rest of the galaxy.